Rumour No. 1: Barcelona are hawking Zlatan Ibrahimovic around Europe’s elite after growing tired of the Swede’s stroppy attitude, and have offered both Chelsea and Manchester City the chance to sign the moody striker for £40 million. Chelsea are apparently willing to consider a move for ‘Ibragoal’ but only if their £50-million-pursuit of Liverpool’s Fernando Torres turns out to be fruitless. However, Manchester City (who are perfectly capable of funding the move) are understandably reluctant to bring in a player whose sullen demeanour could provide further disruption to a squad that is reported to be frayed at the best of times. Rumour No. 2: Everton midfielder Mikel Arteta contract talks at the club have reached an impasse, putting Manchester United and Arsenal on ‘red alert’. 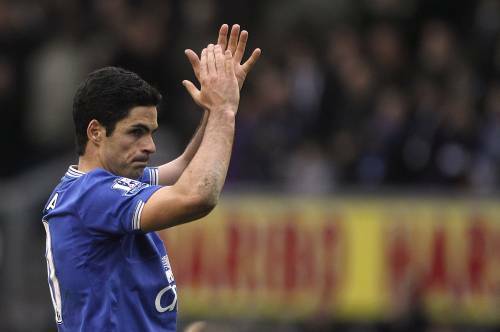 Arteta has two years left on his current deal at Goodison, but Everton officials want to tie the Spaniard to a new, longer-term contract – which the player himself is hesitant to commit to, given the calibre of interest in him. The Best of the Rest: Liverpool are weighing up a bid consisting of £2-million-plus-Yossi Benayoun for Tottenham’s Russian forward Roman Pavlyuchenko. Liverpool are also tracking CSKA Moscow’s young Turkish winger Caner Erkin but may face competition from Spanish side Espanyol for the 21-year-old’s signature. Everton are planning to pinch £7-million-rated Man City striker Craig Bellamy from under Spurs’ noses, and the Toffee’s are also expected to wrap up a Bosman deal for Leeds hitman Jermaine Beckford over the next few days. Manchester United are being linked with a move for £17-million-rated (eh?) AC Milan forward Marco Borreillo. Manchester City are plotting an audacious double raid on Aston Villa for Gabriel Agbonlahor and Ashley Young. William Gallas looks to be on the verge of leaving Arsenal after Gunner’s chairman Peter Hill-Wood called the Frenchman’s £80,000-a-week wage demands ‘extravagant’ – I suspect he used rather stronger terms in the privacy of the boardroom. Lens striker Aruna Dindane will snub interest from Wolves, Blackburn and Bolton in favour of playing Champions League football with Panathinaikos next season. Stoke may try to take advantage of the managerial upheaval at West Ham by lodging a £5 million bid for midfielder Mark Noble. Birmingham are to tempt Wigan Athletic with a generous bid for winger Charles N’Zogbia. Blackpool are willing to splash out £2 million to turn play-off semi-final hero DJ Campbell‘s loan move from Leicester City into a permanent one. For Deco forget Hamsik unfortunately he seems Inter bound (but he’d be ideal if he changed his mind…). Pjanic really stood up during the CL but RM have been after him since he sent them out. Dzagoev is a Chelsea fan, and part of CSKA’s Chelsea factory. David Silva will probably end up staying in Spain, as good as he’d be he is not the most likely of the group. Kaka is also possible if part of a swap with RM for Ashley Cole. Kaka is also possible but unlikely. Contractually Ballack is still up in the air, he’s been linked with Liverpool (not happening), Inter (maybe), Bayern (most likely). If he goes Schweinstiger is the obvious replacement. Matic will have a role to play but we need a true replacement for Michael as Matic won’t be truly ready for a few years yet. Joe Cole is all but gone. Front runner Angel di Maria aside, the options boil down to Miroslav Stoch, Gai Assulin and Thaigo Alcantara both of whom’s availability depends on what happens at Barcelona transfer wise (regarding Cesc), the man from their cross town rival’s, Javi Martinez is another option. Hatem Ben Arfa is an unlikely signing, but would be great as would Diego Perotti and Joao Moutinho. Neven Subotic and David Luiz have all been mentioned, with Luiz (alongside Bruma) is probably the best option to replace Belletti and Ferreira. Darijo Srna, Juan Manuel Vargas and Dani Alves are all possible movers but unlikely ones. Giorgio Chiellini would be a great signing, unlikely but with Carlo around you never know. For Anelka, the clear front runner is Aguero. Pato seems destined to one day join Chelsea, Milan are desperate not to loose him for next season the likely outcome will be Pato signing this season and being loaned back to Milan, whilst Aguero/Suarez come in this year. Finally there is Luis Suarez who is in if Citeh outbids us in the race for Aguero. Villa and Torres are possible but unlikely. As for Kalou there are several options, Moussa Dembele a highly talented and strong physical forward, who fits in well with our style of play. Though potentially outclassed by rising stars Romelu Lukaku and Lacina Traore any of those three would be good signings. There is also Neymar. Romelu Lukaku is a must! Seydou Doumbia’s move to CSKA moves him into Abramovich’s orbit. For youth signings, Uruguay’s Urreta should be a 2012 priority signing. Christian Eriksen and Romelu Lukaku should also be key targets. Lukaku in particular must not be allowed to slip through our fingers.